The 2018 Kansas high school football season has come to a close as state champions were crowned in all eight classes this past weekend. Five teams highlighted as preseason No. 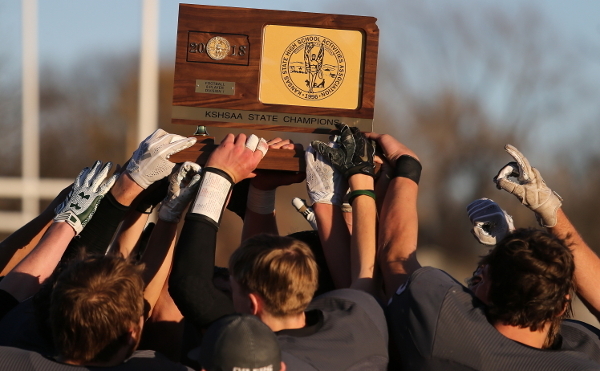 1’s in the Kpreps.com rankings brought home state titles this fall. The three other classifications were won by teams ranked No. 2 in our preseason poll. Let’s take a look at the final rankings for the 2018 season. Derby held off Blue Valley North, 24-16, to win its fifth state football title and its fourth in the past six seasons. The Panthers broke a 10-10 tie at halftime with touchdown runs by Tre Washington in the third and fourth quarters. Washington finished with 242 rushing yards and three scores, while Hunter Igo rushed for 187 yards on 35 attempts. Blue Valley North finishes second in the Class 6A poll followed by Olathe North, Manhattan, and Lawrence Free State. St. Thomas Aquinas captured the schools' first state football championship with a 49-28 victory over Wichita Northwest. The Saints scored 21 points in the first quarter and scored twice in the third quarter to lead 35-0. Northwest pulled to within 14 points twice, but the Saints had an answer each time. Tyron "Tank" Young rushed for 329 yards and four touchdowns to lead the Aquinas ground game. Northwest’s explosive rushing attack that averaged 410 yards per game this season was slowed to 110 yards in the game. Wichita Northwest finishes second in the Class 5A poll followed by Maize, Bishop Carroll, and Mill Valley. Bishop Miege won its fifth straight state football championship and the schools' ninth overall with a 69-31 win over Goddard. The Stags led 49-24 at halftime and 69-24 after three quarters. Miege quarterback Sam Pedrotti passed for 358 yards and threw five touchdown passes in the game. Brison Cobbins rushed for 132 yards and three scores to lead the Miege ground game. Pittsburg finishes second in the Class 4A poll followed by Basehor-Linwood, Goddard, and McPherson. Sabetha's Gabe Garber converted the game-winning two-point conversion on a dive for the pylon as the Bluejays edged Pratt, 43-42 in overtime to win their second consecutive Class 3A state title. Sabetha led 18-0 in the first half before Pratt scored three straight times to take a 21-18 lead. Sabetha tied the game with a Braeden Cox field goal and the two teams traded a pair of touchdowns in the fourth quarter to send the game to overtime. Pratt scored first in OT on a Travis Theis touchdown. Garber hit Ryan Stapleton on a touchdown pass to pull within 42-41 setting up the winning two-point attempt. Pratt finishes second in the final Class 3A poll followed by Andale, Scott City, and Galena. Phillipsburg won its second state football championship with a 27-0 shutout of Riley County. The Panthers scored in each quarter and slowed the Riley County offense to 150 yards of total offense. Trey Sides passed for 150 yards and two touchdowns for the Panthers. Sides closed out his high school career with a state title after leading the Panthers to a 2-1A title in 2015 as a freshman. Conway Springs finishes second in the Class 2A poll followed by Hoisington, Riley County, and Silver Lake. Smith Center won its second consecutive state championship and tenth overall by beating Olpe, 59-0 on Saturday. The Redmen rushed for nearly 360 yards and shut down the Eagle offense by forcing four turnovers in the first half. Ethan Peterson led the Redmen with 161 rushing yards and three scores, while Colby Benoit added 118 yards and three more scores. Plainville finished ranked No. 2 in the poll followed by Olpe, Centralia, and St. Mary’s Colgan. Central Plains captured its second state football championship since 2014 with a 52-6 victory over Solomon. The Oiler defense was dominate in holding the Gorillas to minus-23 yards of total offense. For the season, Central Plains allowed only 34 total points. Myles Menges rushed for a touchdown and threw a pair of touchdown passes. Alex Hickel led the Oiler ground game with 74 yards and two scores. Saint Francis finished ranked No. 2 in the poll followed by Hodgeman County, Hoxie, and Solomon. Hanover built a 20-point halftime lead and held off Osborne, 58-50, to win their third straight eight-man state title. The victory was Hanover's 38th straight. Daiken Stallbaumer passed for 200 yards and three touchdowns, and rushed for 114 yards and three more scores. Carter Bruna added 110 yards rushing and two scores, while Thomas Atkins had 143 receiving yards and two touchdowns in addition to a kickoff return for a score. The 108 combined points set a record for the highest combined output in eight-man state history. Osborne finished ranked No. 2 in the poll followed by Axtell, Dighton, and Otis-Bison.